This top-down, one-piece, gossamer-weight wrap with a drawstring waist and gathered peplum, will be perfect with your best dress or a cotton tank. 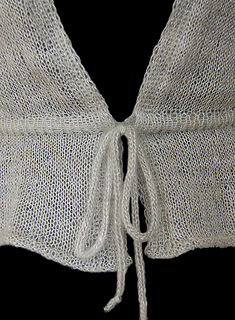 The cap sleeve is gathered at the cuff and worked with 2 sets of short rows, one at the shoulder and one at the cuff. The tube for I-cord tie at the waist, is made by dividing the stitches, one at a time, to front and back needles, working them separately in St st, then joining them again, one st at a time from each needle.